If you watched the debut trailer for Independence Day: Resurgence that dropped earlier today, you probably noticed an interesting lack of Will Smith's Steven Hiller. In reality this is because the actor wound up being too expensive for the production, but given that the character's son is one of the main heroes of the movie, many have wondered exactly what happened to the hero. Well, now a viral site for the film has revealed his fate: he died in a giant explosion. In addition to launching the first full-length trailer for Independence Day 2, 20th Century Fox has also unveiled the creation of Warof1996.com - a website that is dedicated to the history of the alien invasion that happened 20 years ago (a.k.a. the year that Roland Emmerich's Independence Day was released). 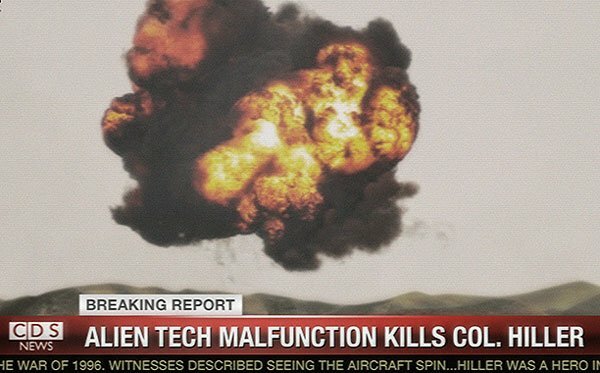 Going through the posted timeline after the events of the invasion, you can find a headline from a broadcast that reads, "Alien Tech Malfunction Kills Col. Hiller." While test piloting the ESD’s first alien hybrid fighter, an unknown malfunction causes the untimely death of Col. Hiller. Hiller’s valor in the War of ‘96 made him a beloved global icon whose selfless assault against the alien mothership lead directly to the enemy’s defeat. He is survived by his wife Jasmine and son Dylan. Knowing how science-fiction works, it's entirely possible that this is part of some kind of massive secret mission, and that Hiller is actually in hiding for some reason (you know, just in case they can bring him back for a theoretical future sequel). For now, though, fans probably shouldn't expect Will Smith to have some kind of magical cameo in Independence Day: Resurgence. Instead of Col. Steven Hiller, the Hiller clan will be represented by the two individuals mentioned in the blurb - with Jasmine once again played by Vivica A. Fox, and the grown-up Dylan played by Jessie Usher. They are part of a large ensemble that also includes returning stars Jeff Goldblum, Bill Pullman, Judd Hirsch, and Brent Spiner in addition to newcomers Liam Hemsworth, Joey King, Maika Monroe, William Fichtner, Charlotte Gainsbourg, Angelababy and Sela Ward. Based on a script by Carter Blanchard, the film will be arriving in theaters as part of next summer's massive lineup of blockbusters - and will be ready for your viewing pleasure on June 24, 2016. Stay tuned for more of our coverage!